I have a confession to make: I might finally b getting sick of “Royals” hogging the top of the Hot 100. I still luv Lorde and “Royals” is definitely 1 of my favorite songs of the year. It’s just, she’s been number 1 for nearly 2 months and maybe it’s time 2 give some1 else a chance. Lorde isn’t the only 1 staying put on the charts. There’s only 1 new entry into the top 10 this week and that replaces 1 or Lady Gaga’s 2 songs from last week. It’s time 4 some new faces! I’m sorry, Lorde! But 8 weeks probably is enough. Eminem earns on the silver on both the Hot 100 and the Billboard 200. Nice job! PLEASE! GO! AWAY!!! I asked nicely. Just when you though AVICII was ready to go sleep, he moves up one spot to number 4. 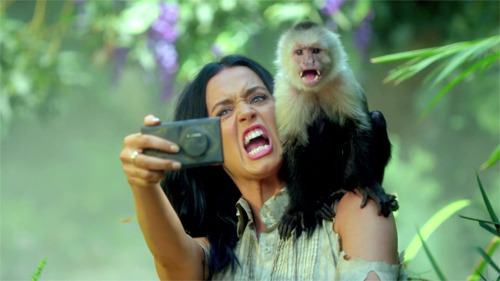 Did every1 check out Katy’s latest video? Sooooo amazing!!! “Counting Stars” continues to rise moving up to the six spot. Guess I spoke 2 soon about “Demons” as it climbs two spots after falling last week. Never underestimate a dragon! I hope this isn’t Drake’s final week in the top 10. I’m going 2 miss that GIF! So cute!!! While “Applause” rises one spot this week, Gaga’s single “Dope” falls out of the top 10 after debuting last week at number 8. At least she has the top album on the Billboard 200! Tourmates Pitbull and Ke$ha barely make the leap into the top 10. Has any1 tried Pitbull’s fragrance yet? Does “Royals” deserve the title of song of 2013? Let us know in the comments below! BE A PART OF THE MYMUSIC CHARITY DRIVE!